Description: Here’s a great cool swing chart for advancing groups reminiscent of the music of Stanley Turrentine and Cannonball Adderley. Although it employs the blues scale, it is not a blues. Ad lib solos are offered to tenor sax, trumpet and trombone. When exaggerating the articulations and dynamics, your group will create a lot of musical excitement! Rhythm section parts are partially notated with chords cued, and a guitar chord chart by Jim Greeson is included. Duration 6:20. 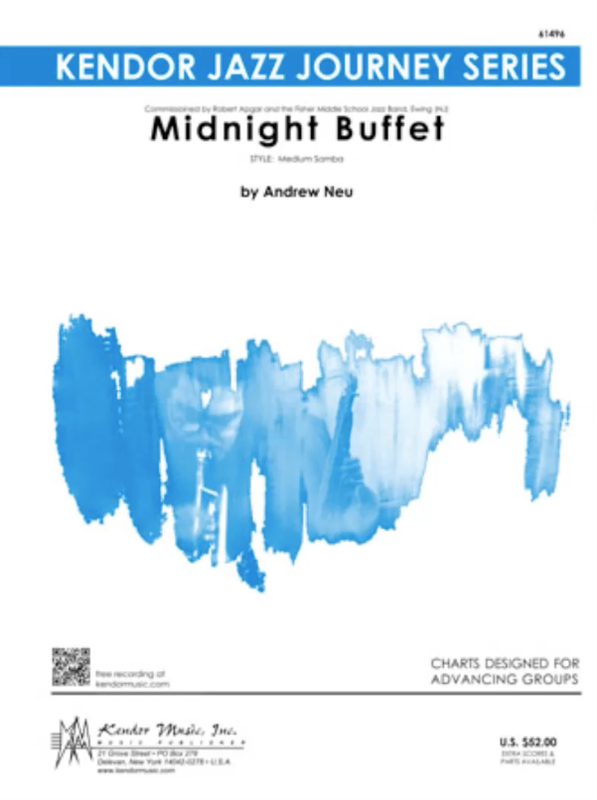 Description: This chart for advancing groups is inspired by the music of Henry Mancini and the spy movies of the 1960’s. This cool minor swing tune features alto saxophone, trumpet and guitar on the melody, and written or ad lib solos for alto and trumpet. 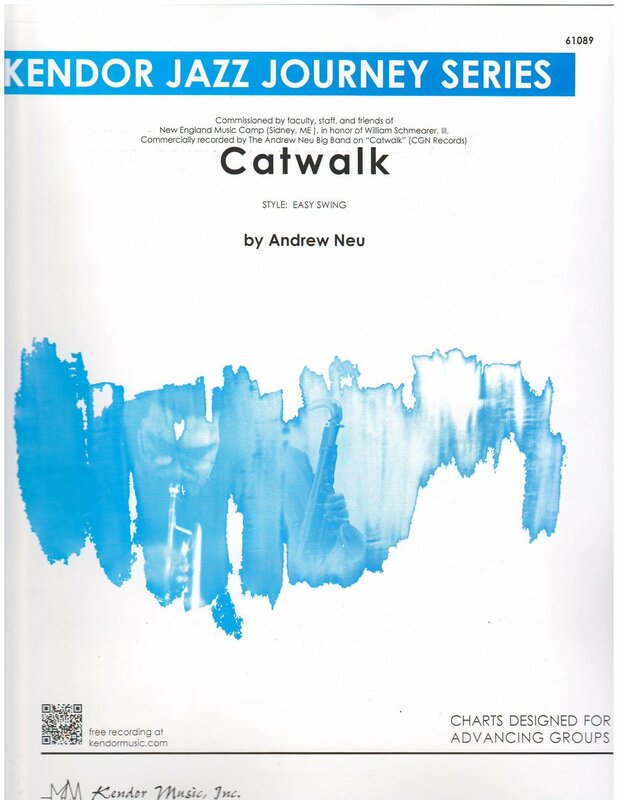 It is also the title track for the most recent Andrew Neu Big Band CD Catwalk (CGN Records). A guitar chord chart by Jim Greeson is included in each set. Duration 7:30. Description: In this terrific tip-of-the-hat tribute to Don Menza’s famous Groovin’ Hard chart, saxes get the major workout, supported by cleverly written brass parts, all in a shuffle swing style. Solos are given to alto, tenor, trumpet and trombone, with an 8-bar drums-only solo leading into the shout section. An unforgettable finish makes this the perfect program closer for proficient groups. Duration 7:45. Description: Inspired by the music of Brazil, this chart for advancing groups is an upbeat, catchy medium samba that’s impossible to get out of your head. Written or ad lib solos for tenor saxophone and trumpet lead into a vamp and drum solo. A guitar chord chard by Jim Greeson is included in each set. Duration 6:10. Description: Reminiscent of the music of Quincy Jones and Henry Mancini in the 1960’s, this catchy boogaloo for advancing groups is a fun-loving fusion of Brazilian, Afro-Cuban and American funk influences. The easy solo changes are based on a minor blues with an 8-bar bridge; while tenor and trumpet are the designated soloists, chords are also cued for alto and trombone. A guitar chord chart by Jim Greeson is included in each set. Duration 6:25. Description: Commissioned by Cannonball Musical Instruments, this American Brazilian samba is perfect for advancing groups. Similar to American Latin jazz artists Chuck Mangione and Spyro Gyro, this samba original also channels the infectious music of Brazil. An open solo section (written or ad lib) and a driving shout chorus will make this an exciting closer to your program. The 1st Alto part doubles on soprano sax, however an optional 1st Alto only part is provided. A guitar chord chart by Jim Greeson is included in each set. Duration 6:10. Description: Written in the style of classic big band shuffles from Don Menza and Gordon Goodwin, this chart for proficient groups is ideal for festival or concert fare. Each section gets to step into the limelight during this effective programming choice. Groove is the operative word when rehearsing this shuffle chart, but there are many other features that make it a great addition to your library. Rhythm section parts are partially notated with chords cued, and a guitar chord chart by Jim Greeson is included. Duration 5:50. Description: Your audiences will love this retro R&B original with an upbeat, infectious groove. Originally record by the composer on Try Something Neu (NuGroove Records NUG-2036-2), this chart is reminiscent of the “old school” Sound Of Philadelphia sound from the 1970’s. Rhythm section parts are notated with chords cued, and a guitar chord chart by Jim Greeson is included. Duration 4:40. Description: Emulating the exciting style of Arturo Sandoval and Paquito D’Rivera, this catchy Latin tune for advancing groups alternates between Afro-Cuban and samba grooves. Chord changes for the open solo section are included for alto, tenor, trumpet and trombone, and a 30-bar drum solo leads to a dynamic, hard-to-forget finish! A guitar chord chart by Jim Greeson is included in each set. Duration 5:00.